Originally named the Peace Air Navigators as the were owned by the Regional Airline based in Peace River. We play in the North West Junior Hockey League. 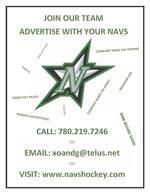 Our league consists of 8 teams throughout North Western Alberta and North Eastern British Columbia. Fort St John, Dawson Creek are the two teams in BC, while Grande Prairie, Beaverlodge, Sexsmith, Slave Lake and Fairview are with us on the Alberta side.